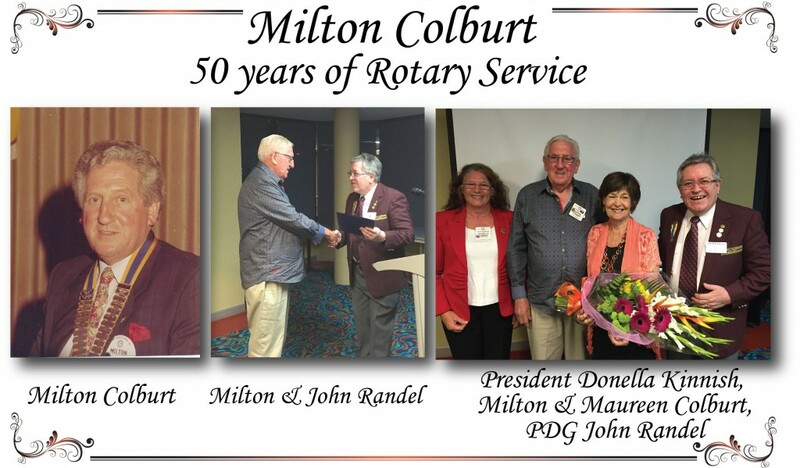 Our Rotary Club of Ballina-on-Richmond had the privilege of acknowledging and celebrating 50 years of Rotary Service in 2016 of club member Milton Colburt. Milton’s contribution to Rotary is outstanding and our club is proud to have Milton, with the support of his wife Maureen and family as one of our treasured members. Milton joined Rotary in 1966 at the age of 27. He was a member of the Hunters Hill Rotary Club and then Castle Hill Rotary Club (then known as Baulkham Hills). Milton, during his Rotary career served various club roles including President of his club in Sydney in 1987-1988, which at the time had 74 members. Milton received his Paul Harris Fellow in 1992 and Maureen received hers at the last function they had at their home in Dural before they moved to Ballina. Milton then joined Ballina-on-Richmond. Milton was the founding chairman of the Ballina Fine Wine and Food Festival. Milton and his family hosted exchange students over the years, his 2 children were also exchange students. Milton supported all youth activities especially, RYLA, RYPEN, Interact and his daughter Chartered a Rotaract Club at Galston in 1988. He has always supported other Rotary organisations including Inner Wheel (Maureen, his wife has been President of various Inner Wheel clubs). Milton is an outstanding Rotarian and we are very fortunate to have Milton as one of our valued club members. What does Rotary mean to me? Why did I join Rotary? Why am I in Rotary? Yes Rotary is about Fellowship, Friendship and Fun however for me it is about an extended second Family. For us our family is very small. I see Rotary as an extension of Family. BOR fits this description as it extends warmth and unconditional regard to the members. Plus the hugs are good too!